David Finlay and his wife Wilma said their goal is to achieve the "highest ethical standards possible"
A dairy farming couple have launched 'The Ethical Dairy' in their bid to "de-intesify" the industry. Organic dairy farmers David and Wilma Finlay have spent a decade on their journey to find a "new approach" to dairying. The couple said they have launched their solution: Keeping the calves with their mothers to suckle, and taking less milk as a result. They said it is their answer to the "public’s increasing criticisms of the dairy farming industry." David Finlay explained that the couple are not "demonising" the industry, but are just achieving the "highest ethical standards" possible. 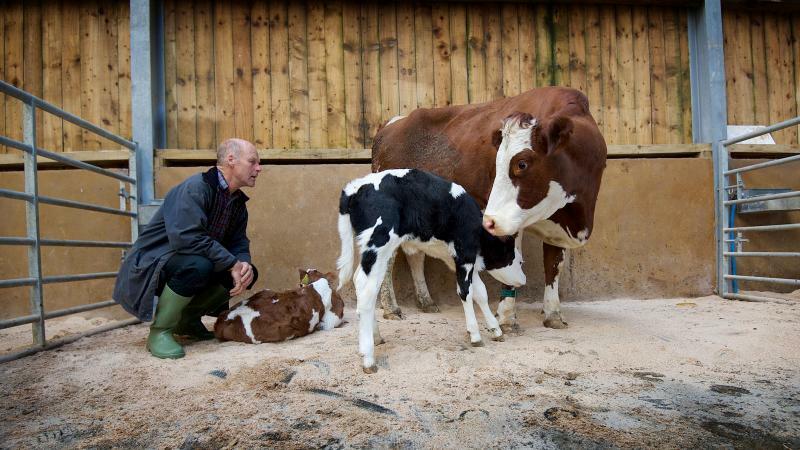 “What we’re doing is de-intensifying dairy farming. It’s almost the opposite of what’s happening elsewhere in the industry,” Mr Finlay said. “By branding ourselves The Ethical Dairy we are not demonising farmers nor claiming to be perfect. What we’re trying to convey is that in everything we do we aim to meet the highest ethical standards. “Our goal was to farm in a way that is resilient, ecologically sound and less stressful for the animals and the people working with them. So we’re leaving the calves with their mothers to suckle. Transitioning their family farm in Dumfries and Galloway to the new model has been a "long and expensive journey", according to Wilma Finlay, but they are now producing a "financially viable farm". Dumfries and Galloway is home to 45% of Scotland’s dairy industry, and introducing a radically different dairy model in the heart of one of the UK’s biggest dairy regions has not been without challenge. David Finlay added: “Many people in the farming industry think we’re completely crazy. Financially it’s been extremely challenging, but the cows and calves just love it. We’ve given ourselves 3 years to break-even and 18 months in, we are already seeing some daylight. For the farming couple, their goal is to "revolutionise the dairy industry" by persuading other farmers of the benefits of this new system.